A Critical Analysis of "Android Economics"
I've made a slight adjustment to my weekly schedule to squeeze in this small piece about Android Economics. There is an analysis being floated around the web, based on figures from Oracle's lawsuit on Google claiming Java patent infringement by Android. The Guardian has estimated Google's Android revenues based on these figures, following which Horace Dediu over at Asymco has posted an analysis of Android Economics. Let me start off by saying that both the analysis of both the Guardian and Horace Dediu are just plain wrong on many levels. First, here's an overview of Google's mobile advertising revenue model for a background to this piece. Now, on to the article. The whole premise of the article is wrong. 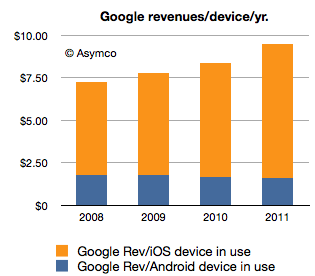 The $550 million figure relates not to Android revenue, but to android revenue related to the two patents in question. Danny Sullivan has posted an overview covering these details and the figure has been directly invalidated by Google, so I won't get into it too much. Now no one knows the what proportion of Android revenue that is, but based on every single analyst estimate, it is in the range of $7 per device. In any case, any numbers thrown around in legal proceedings should be taken with a fistful of salt because Google has every reason to understate the revenue to reduce damages. Ad revenue is earned everyday, meaning ARPU should be calculated on the average number of active devices in a year, not the number of devices activated in that year. The author takes $400 million in estimated revenue for 2011 and divides that by 240 million active devices for 2011. Even by assuming linear growth in a year, the average number of active devices in a year are 80 million activations at the end of 2010 + (160 million purchases in 2011)/2, ignoring replacements, there were 240 million active devices at the end of 2011 = 160 million, which would cause a huge jump in ARPU as compared to what Mr. Dediu came up with. Last year, in a testimony to Congress, Eric Schmidt mentioned that iOS was responsible for 2/3rds of Google's mobile revenue. Since Apple had a head start, Apple had a larger install base at the time. Also, Apple still has a lead in the tablet space and tablet ARPU is closer to the PC rather than smartphones. More importantly, this information is too dated to be used in the current context, and no advertiser cares what platform end users are on, the only thing that matters is reach & demographics. Therefore, it is not rational to assume higher ARPU from iOS devices (as long as we don't compare smartphones to tablets), as compared to Android, considering that Android's install base has surpassed that of iOS.